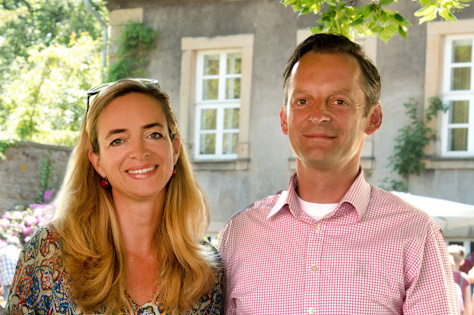 We are the driving force behind the idea of ALLODIEN: Nicolaus and Tania von Schöning, owners of Rittergut Remeringhausen. First of all our wish was to create a network with people similar to ourselves, who put all their energy into the preservation of the cultural heritage entrusted to their care. But at the same time, we also wanted to share the spirit behind all this with others. All members of the ALLODIEN CASTLE CLUB have something in common: We represent certain values. For us this especially includes respect for other people, nature and our cultural assets. We are driven by more than just the will to generate some quick profit with off-the-peg mass-events. We want our guests to feel good, we want to share with them the joy we draw from our task. We will still be at our estates tomorrow, fixing damages after events and caring for our gardens. We do not just produce an event in order to follow through with the next one at a different location the next weekend. We put all our hearts and souls into what we do! We started to renovate our own little castle in 1997, so we know very well the passion with which many of our friends manage their estates. We preserved the old building structures wherever this was possible. For years we have been renovating all the buildings, very carefully and little by little. We restored the old garden of the estate to its old splendor, according to the plans of the court gardener Homburg dating back to the year 1804, renaturalized ponds, planted hawthorn hedges, rare species of roses, trees and bushes, preserved our 500-year old lime tree and our tulip poplar, replanted a historical kitchen garden and reconstructed a self-supporting abutment system following historic examples. Because these things matter to us. We organize all our events together with our dedicated team of employees. This way we ensure that our estate will be preserved for generations to come, and we can give many people an opportunity to cast a glance behind the scenes. The ALLODIEN CASTLE CLUB was formed as a network in order to enable exchange between each other. But most of all we wish to give an itinerary to all those people, who appreciate our values – an itinerary giving them assurance that they will find estates that are managed with care and respect for humanity and nature. ALLODIEN derives from the Medieval Latin word allod or allodium. In Medieval and Early Modern law this word described property the owner (proprietor, the hereditary lord or the hereditary lady) was free to dispose of. Accordingly, the conversion of benefices into personal property is referred to as allodialization. ALLODIEN. For us this means a whole world of its own. Think of it as a land of fable, to which we would like to invite you, our dear guests, so you can enjoy the beauty of life, far away from daily routine and global news. Here you can lean back and relax.